It is hot these days in Barcelona so even animals so well adapted as this dromedary at the zoo seem to be claiming for justice: no more sand! I want to be transfer to the penguin tank! 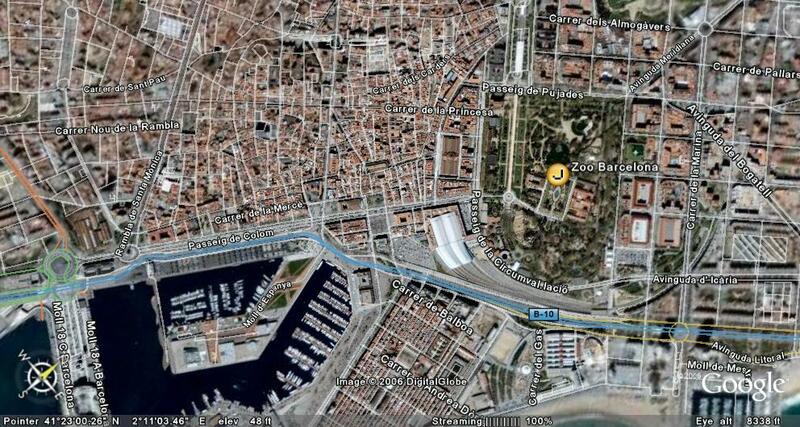 See Picture of Barcelona Zoo on a Google Earth Map. Such a pitiful creature! Somebody get that poor animal a wading pool. Nice shot, really depicts the heat well for us. aburrit, molt aburrit...el dromedari he!!! Certainly seems to have taken the hump! He does seem to wanting others to take pity on him, and I do. I love the juxtaposition between the pen/cage/holding area nad the skyscraper! The weather forecast is minus 5 degrees for us tonight..brrrrrr!! Luckily, our day time temperature is not bad. The poor fellow. Some one dump a bucket of water on him! ooh, you've gone large too! wonderful shot! it's as if he's tried of the modern development behind his hut!